Okay, I totally made that name, Passionista, up on the spot. But, if kind of fits, right? 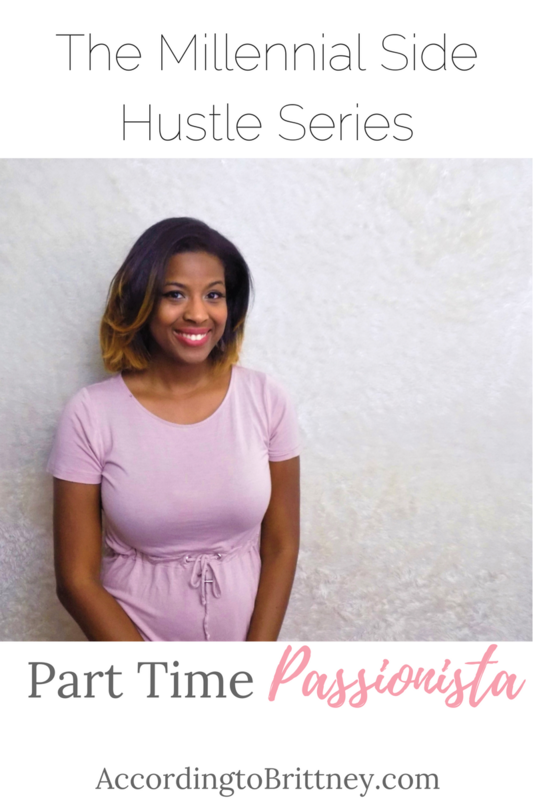 Anyway, here’s something new and cool I’m doing – The Millennial Side Hustle Series! This series is going to focus on the ambitious millennials who manage two or more gigs! The people who get stuff done, not only in their day job, but on their passion projects, as well! In this series, I’m going to be interviewing awesome people who are killing it all around. There will be more details to come soon. But, to get started, I’m going to tell you about me – the Part Time Passionista (I’m totally going to call myself that from now on). I’m going to be talking about my day job, darn near three side hustles: this blog, my social media freelancing, and my new career styling biz, and how I balance it all! This is going to be a recurring series so be sure to subscribe for me stories! I absolutely adore my day job. This article is titled “The Part Time Passionista” because currently I work part time. I started in March and I’ve adjusted to this awesome schedule now. But, at first, I was kind of freaking out. I was working over full time at my last job. Plus, trying to build this blog and do freelancing. I’m sure you could probably tell from that description, but I wasn’t happy at my job. So, the whole situation was crying out for some change. Little did I know, that change would be this part time gig! I work three days a week at an international specialty chemicals company as a marketing specialist. The perks of my day job are incredible. I work 3 days a week which allow me to focus more time on my side businesses. Plus, I’m still as financially secure as I was at my previous full time job. Even more so! My first side hustle is this amazing blog that has grown so much since I first started it. It went from this place I went to when I wanted to write about my life to this amazing resource for women who want to get better at adulting. This is like my child. I love it with my whole heart and soul. My next business is my social media freelancing gig. My background is marketing and social media, so it made sense to do this for others. I love social media! Growing, creating, and engaging online is like my favorite thing to do! Looking for a social media manager? Hit me up! Lastly, this blog stirred up a whole other idea in me – helping people land into the career of their dreams! Anyone will tell you that I am ambitious. I want it all. A lot of people close to me saw that so when they needed career advice, they’d come to me. I helped a lot of friends and family write their resumes, find the right career path, and ace interviews. So, that’s how my career styling business came to be. Still growing it and haven’t officially launched. But, I’m so excited to be headed down this path! My side hustles and my day job are like peanut butter and jelly. I’m a marketing specialist by trade. In my day job, I create content, do market research, and make website adjustments. And guess what I do for my blog? I create content, do market research, and make website adjustments. The skills I use everyday in my job help me in my side hustle and vice versa. They work together to level me up! Sometimes, I don’t know how I do it. Working part time definitely helps, but I am anticipating to start working more hours soon. The biggest thing I do to manage myself is get rid of guilt. I would feel so guilty sometimes when I would come home from work and sit on the couch all night. Why wasn’t I using that time to write some posts or do some more research? Because I was tired and wanted to rest, that’s why. Sometimes, side hustlers work too much. We want to succeed. But, like everyone else, we need a break. So, I stopped feeling bad when I chilled instead of worked. Anything that I need to get done, will get done. The best part about working on your own stuff is that YOU get to decide when you do it. If you’re going to feel bad when you don’t feel like doing it, why are you doing it? I love my side hustle because I’ve always wanted to have my own business. For as long as I could remember, that’s been my dream. I love growing something and watching it turn into that vision. Learning all about things that I wouldn’t get to learn at my own job like finances, sales, and client management really excites me. I love that my blog gives me the voice that I’ve always wanted. For a long time, I didn’t think I had a voice or anything to say that people would care about. But, as this blog continues to grow, I see that this is far from the truth! We all have a voice, we just need to use it. Never stop learning. Read! Always read. There is so much information out there which can be a good thing. Be an expert in your craft by keeping up with trends and knowing as much as you can. But, also there is a lot of information out there. Don’t let yourself get overwhelmed. Rely on a few trusted sources. If you try to learn everything at once, you might as well learn nothing at all! Do what works best for you! Are you a side hustler? What do you love about it? Comment below!